Congrats to last month's winners. This month . . . care to visit Silent Hill? You have until JUNE 1ST, 2014, 12:01AM EST to complete these tasks! Good luck! Rejoice! The Advent is full of good tidings and generosity. 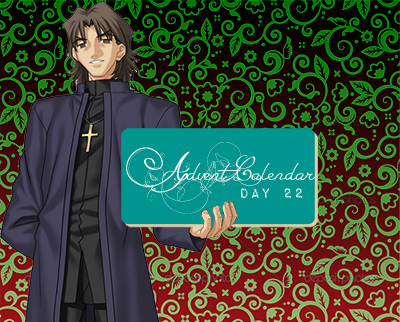 Please leave your cards in Kirei's capable and trustworthy hands this holiday post. . .
. . . oh. That's not what I meant to say at all, was it? The theme of today is repaying kindness. * What are some characters who make sure to give as good as they got? A student who finally repaid his teacher for the lessons learned. Or an old friend who looked after a mentor's child, furthering their old mentor's spirit and wishes for the future. * - You don't have to meet Kirei's brand of kindness repayment, it can be actual honest kindness! The poet needs to buy words from you so that he can finish his poems! He'll give you a card for every letter you sell to him and a bonus card for every whole word you can provide. Basically, you need to trade to spell your words! The first letter of either the CARD or the PLAYER you trade with are the letters you use to spell your words. You will have a week to do so. For example if the word of the week is DESK. To get a 'D' I can trade with Delitan or I can trade the card defeated07. For trading cards you can either be the person trading the card AWAY or the person RECEIVING the card. For player trades though you MUST trade with someone else. So I can't use 'AJ' for the letter 'A'. You cannot reuse the same player/card in one week. If the word is "EYE" you need TWO different players or cards that start with 'E'. You may not reuse a trade/card from a weekly challenge to fulfill the monthly challenge. Trades must be even numbered cards. As a holiday bonus for completing this round you'll get an extra card! So that's a total of 6 cards! Please provide links of your trade. If you use a website logging system please link your log. However it is preferred that you have a link somewhere as opposed to email/website logs just because it makes it easier to check. Thank you! * the date completed. So if you start a trade on the 19th and it ends on the 24th it's fine to use. However if you start a trade on the 21st and it ends on the 30th it would not count. This is mostly to prevent trades from hanging over too far into the next week, I know it might be a little rushed that way but remember even if you can't get the whole word you can still get partial credit for most of the word! For completing this week's word you will also receive a crayon, since iirc q is a relatively rare deck starting letter! * the date completed. So if you start a trade on the 12th and it ends on the 15th it's fine to use. However if you start a trade on the 15th and it ends on the 22nd it would not count. This is mostly to prevent trades from hanging over too far into the next week, I know it might be a little rushed that way but remember even if you can't get the whole word you can still get partial credit for most of the word! That is -- the irrational fear of the number 13! Do you jump the 13th step? Or maybe avoid flying on Friday the 13th? If you don't have any 13 related superstitions feel free to share any others. Broken mirrors, ladders, black cats, not washing your socks on game day, etc! For answering this you can immediately take one choice card numbered 13 and you'll get one random special! 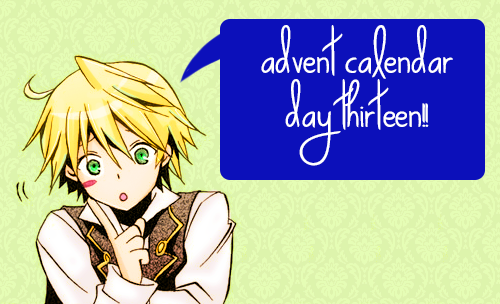 This post will be open until December 31st like the rest of the advent posts! * the date completed. So if you start a trade on the 6th and it ends on the 8th it's fine to use. However if you start a trade on the 8th and it ends on the 17th it would not count. This is mostly to prevent trades from hanging over too far into the next week, I know it might be a little rushed that way but remember even if you can't get the whole word you can still get partial credit for most of the word! * the date completed. So if you start a trade on the 30th and it ends on the 2nd it's fine to use. However if you start a trade on the 5th and it ends on the 9th. it would not count. This is mostly to prevent trades from hanging over too far into the next week, I know it might be a little rushed that way but remember even if you can't get the whole word you can still get partial credit for most of the word! EEK, WINTER WIND BLOWS COLD! VOWELS MUST BE WARM COLORED CARDS so that means your E, I and O trades must be Red, Yellow, Orange or Brown. CONSONANTS must be cold colors -- Blue, Green, Purple or Gray. The "," trade can only be fulfilled by a trade for a card with the number 13. The "!" trade can only be fulfilled by a signature card trade. If you complete all trades EXCEPT punctuation you will receive 27 cards (22 letters + 5 words), if you complete all trades WITH the punctuation you will also receive 2 random crayons! * the date completed. So if you start a trade on the 15th and it ends on the 17th it's fine to use. However if you start a trade on the 17th and it ends on the 1st of Dec. it would not count. This is mostly to prevent trades from hanging over too far into the next week, I know it might be a little rushed that way but remember even if you can't get the whole word you can still get partial credit for most of the word! EXTENDING the monthly's deadline to the 30th of November! Also the 'weekly' challenge will span over TWO weeks since I'll be pretty busy some things for the end of November! Completion of the double-length weekly challenge (MIRACLE) will net you 1 extra random card and 1 crayon! rewards for last week will go up later tonight, sorry! I got eaten by miniature food videos on youtube.
! - WILDCARD, any trade linked here is fine! <b>WORD:</b> <b>GO!</b></font> <b>WORD:</b> GO! <b>TRADES</b>: G - (traded XCARD for YCARD with PLAYERNAME) <a href="">LINK</a> O - (traded XCARD for YCARD with PLAYERNAME) <a href="">LINK</a> ! - WILDCARD, any trade linked here is fine! * the date completed. So if you start a trade on the 8th and it ends on the 10th it's fine to use. However if you start a trade on the 15th and it ends on the 17th it would not count. This is mostly to prevent trades from hanging over too far into the next week, I know it might be a little rushed that way but remember even if you can't get the whole word you can still get partial credit for most of the word! * the date completed. So if you start a trade on the 21st and it ends on the 27th it's fine to use. However if you start a trade on the 21st and it ends on the 22nd it would not count. This is mostly to prevent trades from hanging over too far into the next week, I know it might be a little rushed that way but remember even if you can't get the whole word you can still get partial credit for most of the word! Only odd numbered cards count. If you're trading with a player the card you trade must ALSO trade an odd numbered card. (So to count for the monthly I need to trade legs05 with Celi. Not legs04, etc).
! - WILDCARD, link any trade here and receive a candy! <b>WORD:</b> BOO! <b>TRADES</b>: B - (traded XCARD for YCARD with PLAYERNAME) <a href="">LINK</a> O - (traded XCARD for YCARD with PLAYERNAME) <a href="">LINK</a> O - (traded XCARD for YCARD with PLAYERNAME) <a href="">LINK</a> ! - WILDCARD, link any trade here and receive a candy! * the date completed. So if you start a trade on the 4thth and it ends on the 7thth it's fine to use. However if you start a trade on the 6th and it ends on the 13th it would not count. This is mostly to prevent trades from hanging over too far into the next week, I know it might be a little rushed that way but remember even if you can't get the whole word you can still get partial credit for most of the word! * the date completed. So if you start a trade on the 26th and it ends on the 29th it's fine to use. However if you start a trade on the 3rd and it ends on the 6th it would not count. This is mostly to prevent trades from hanging over too far into the next week, I know it might be a little rushed that way but remember even if you can't get the whole word you can still get partial credit for most of the word!